Martech guru Scott Brinker recently released his latest marketing technology supergraphic, with almost double the number of marketing technology vendors of last year. Exactly that: the massive and continuing growth in vendors. I caught up to him to ask a few questions about the huge technology landscape, which has grown from 947 companies in early 2014, 350 in early 2013, and just a lonely 100 vendors in the first version, released late in 2011. Marketers who are confused by all the tech in the space had it easy, seemingly, just a few short years ago. But there is hope, Brinker says, for marketing departments that are just simply bogged down in all the confusion. In other words: no, you don’t need to know all 1,900 marketing tech vendors. And no, you don’t have dive into integration hell with 75 different solutions. Keep it simple, and start with the basics. The basics are where a lot of investment is going, and not just from the vendors. Answer a survey (marketing clouds or social media) and we’ll share the results! A recent 5,000-marketer study from Salesforce says that the top five areas marketers are investing in for 2015 are their website, social engagement, social marketing, SEO/SEM, and landing pages. That dovetails nicely with where Brinker is seeing major vendor growth. The question for laborers in the martech salt mines, of course, is when is this massive explosion of innovation going to slow down. And when will life return to “normal,” with standard tools and standard processes. In other words, when will the good old days, the simple days, return? Brinker says that innovation in the era of the cloud could be fundamentally different than pre-cloud, as it’s simply quicker to create and iterate martech solutions on the creation side, plus use and integrate them on the consumption side. Open source technologies are helping as well. 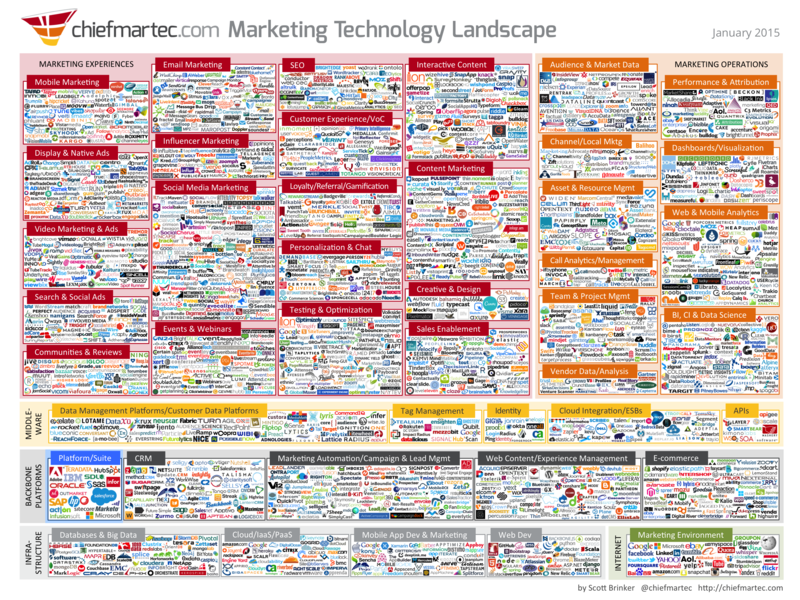 Imagining a 2016 supergraphic with almost 4,000 martech vendors on it seems crazy. And, something that would strain the limits of the biggest monitors. That’s not likely: there’s almost certainly going to be some degree of consolidation via a wave of acquisition. But don’t expect a smaller number, either. “There will be acquisitions and failures there, but I think we’ll still see a lot of new entrants — the inflow will equal or exceed the outflow,” Brinker says. Here’s the full, hi-res version.